“Another fine day you’ve got me Stanley,” nice blue skies and dry weather but a cold wind. I sat at home and watched the clouds scudding first from the North then East and eventually from the South East as the day wore on. The FHC website showed the same pattern and the strength dropped from 16 kts to 5kts . As RO we boarded Noon Hi and Jack Penty took us to the east of Trefusis bouy and pointed into wind. I could see Castle buoy dead upwind so we threw in the hook and made several plans while drinking Green Tea with Lemon and ate chocolate cake freshly baked by Inez! It was decided to send everyone on the same course so that we could shorten and finish at the same marks! Castle to port, Trefusis to port, twice, and home was the plan! Six boats turned out for Q class, 5 of which were IRC rated. Jackdaw and Excelle made good starts with Temeraire and Scorpion heading towards the pin end followed by Encore. The wind had swung further east at this juncture so the starters all struggled to make a good exit from the line on starboard tack. Hawk, sailing under Byron handicap was 15 to 20 seconds behind the fleet, which split soon afterwards, Scorpion and Temeraire taking the Eastern side, while Excelle and Jackdaw favoured the western side, leaving Encore and Hawk in the centre ground. Seven boats then started in U class, 5 of which were IRC rated. Popincoota was still under spinnaker coming from her home port in St Mawes while U class split left and right going up the beat: 3½ minutes later Popincoota joined them and started to play catchup. It was decided to send the two W class boats off on the next slot to keep the fleet together, one of the advantages of rule 26 starts! Puffin made a blinder of a start and was a good 20 seconds ahead of Sweet Friday. The wind came and went as we watched the leaders of Q class round the Castle buoy. Jackdaw rounded and rapidly set her big kite, soon they all began to pop and were all recognisable by the different patterns. It was obvious looking at the spinnakers coming toward us that the wind was losing strength as the incoming tide was pushing the yachts forward causing the inevitable collapse and fill cycle. 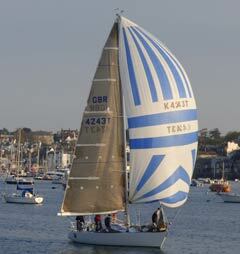 It was decided to shorten course by rounding the Trefusis mark to port and then sailing direct to the club finish line. This was broadcast on the radio and by verbal communications to passing yachts. Temeraire, Martin Eddy won the IRC rated fleet and Scorpion won on the Byron handicap with Jackdaw taking line honours. Deep Purple won the Byron handicap in the U class fleet with Aurora winning the IRC rated fleet. Sweet Friday beat Puffin both on the water and on corrected time. The sun set and it got colder. We came ashore and drank good beer from the barrel of Lushingtons and ate heartily from the caterers. Thanks to Jeanette and Sue aided by Paul in the ops room and Giles for bringing us home.